ChaosSync for Outlook offers the ability to synchronize the Contacts, Appointment Calendar, Tasks and Memos from your Chaos Data directory with the Contacts, Calendar, Tasks, and Memo databases in Microsoft Outlook! Once installed, the ChaosSync for Outlook program will appear on the Accessories menu found within Chaos Intellect 3 or Time & Chaos 7. 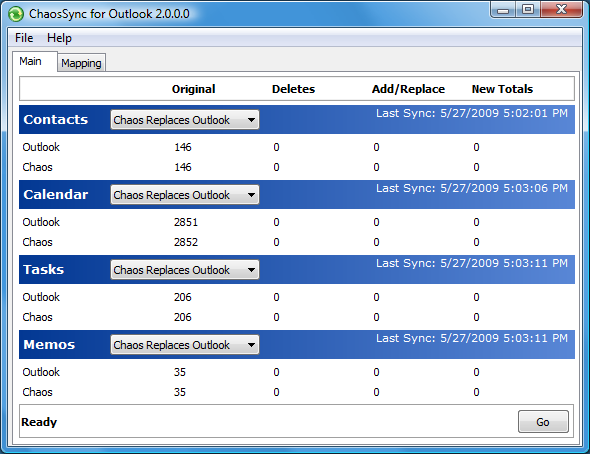 When launched, it automatically uses the current Chaos databases along with your default Outlook database. All that remains for you to choose is the appropriate direction of sync for each section. You can have it do nothing, Chaos overwrites Outlook, Outlook overwrites Chaos or full Synchronize between the two.p>You can even customize the rules for which field in Outlook matches up with a field in our Chaos Databases! This tool is great for users in jobs where the company requires Outlook, but you prefer our Chaos programs instead. It is also useful for many mobile phones that can sync their built-in applications with Outlook. This tool can sync Chaos with Outlook and then by syncing Outlook with your phone, you are in business! ChaosSync for Outlook is $29.95. You can receive a password to install this utility immediately by ordering through our secure online store. Click here to download ChaosSync for Outlook for Chao Chaos Intellect 3 or Time & Chaos 7. The current build of this utility is 2.0.0.3 released 2/20/2017.